I think I'm going to sell off a little gold and try to get some platinum for around $1000 an ounce, or less. If I can find silver or Palladium for it's current spot price I'd do that too. The platinum and palladium I have, though, I'll hold it. I could still sell the palladium for over $400 an ounce though, which is strange. It's rare, people want it, but you can't buy it for the cheap price it's worth. When platinum does go back up to $2000 I'm trading it for gold, provided gold is around $1000 at the time. 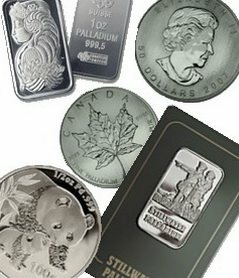 I don't have the money right now and would actually like to trade in some metals for cash, but can't do that now without losing money. Traders earn a lot by knowing the best ratio and trend in trading gold. Do a little research before you deal with gold traders.